1729 - Sophia Augusta Fredericka, a princess of Anhalt-Zerbst is born in Stettin, Pomerania, Prussia. She will later rule the vast Russian Empire under the title Catherine II, but she is better known as Catherine the Great. 1750s - Most people in German speaking Europe are landless subjects of their rulers. They are heavily taxed, have few civil rights, men are frequently conscripted to fight wars, and life is a constant struggle for survival. 1756 - The Seven Years' War begins and some 900,000 to 1,400,000 people will die in this conflict. 1762 - Catherine II (the Great) becomes Empress of Russia at the age of 33. 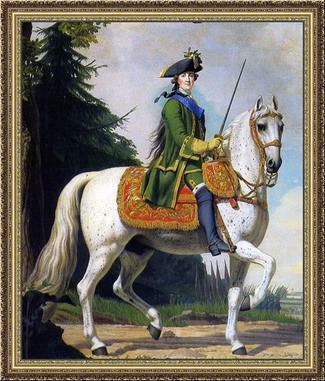 Equestrian portrait of Catherine the Great in the Preobrazhensky Regiment's uniform by Vigilius Eriksen (1762). Source: Wikimedia Commons, Public Domain. 1762 - Catherine the Great issues her first Manifesto inviting foreigners to settle in Russia. Due to a lack of specifics about what was being offered, this Manifesto did not achieve the desired response in attracting colonists. 1763 - The Seven Years' War ends leaving much of German speaking Europe in ruin and poverty. ​1763 - Catherine the Great issues her second Manifesto encouraging Western Europeans to settle in Russia. ​The second Manifesto attracts thousands of colonists from German speaking Europe, largely because of benefits and promised incentives that were not included in the first Manifesto. Drawing of the city of Nidda, Germany from 1633. Source: Hessian Regional History Information System. 1763 to 1766 - Russian government officials and private recruiters encourage migration to Russia. 1764 to 1766 - The Russian government plans for the colonists' arrival. 1766 - The colonists travel by ship to Russia. 1766 to 1767 - The colonists travel by raft and overland to the lower Volga region. 1767 - The colony of Norka is founded on August 15th. By September, there are 753 people living there. 1768 - The first church is built in Norka. 1768 - 104 Mother colonies have been established in the lower Volga region. 1769 - Count Grigory Orlov submits a report about the Volga German settlements (including Norka) to Catherine the Great. 1771 - A fire ravages the fledgling colony of Norka and many homes are lost. 1773 - Renowned German naturalist Peter Simon Pallas visits Norka. 1774 - The insurrectionist Pugachev leads a band of raiders through Norka. 1775 - The fourth revision of the 1702 Russian census is taken. The population of Norka is stable. 1784 - Rev. Cattaneo begins his remarkable 46 year term as the pastor in Norka. 1796 - ﻿﻿Catherine the Great dies﻿﻿ and is succeeded by her son, Paul I. 1798 - The Saratov Office for the Guardianship of Foreign Settlers prepares a census report on conditions in Norka. The population has grown to 1,662. 1801 - Paul I dies and is succeeded by Alexander I. 1811 - The Russian government prepares a census of all males living in Norka. 1812 - Napoleon's invasion of Russia fails and one of his deserting soldiers chooses to settle in Norka. 1814-1815 - A grasshopper invasion devastated Norka and the surrounding area. 1822 - The second church is built in Norka under the leadership of Rev. Lukas Cattaneo. 1825 - Alexander I dies from typhus and is succeeded by Nicholas I. 1834 - A full census of Norka is prepared showing a large growth in population with 4,113 people listed. 1848-1849 - A severe cholera epidemic rages in Norka claiming many lives. 1850s - Due to a growing population and lack of arable land, daughter colonies are established. 1855 - Nicholas I dies and is succeeded by Alexander II. 1856 - Cholera strikes Norka again prompting some to move to daughters colonies east of the Volga. 1857 - The 10th Census Revision is taken and shows 6,300 people living in Norka. 1861 - Russian serfs are emancipated. There is no impact to the Volga Germans who are considered "colonists." 1861 - Tsar Alexander II is assassinated and succeeded by Alexander III. 1862 - Several entrepreneurs from Norka exhibit their cloth weaving at the Great London Exposition. 1868-1869 - Another cholera pandemic rages through Norka. 1871 - The unification of Germany into a politically and administratively integrated nation state. 1871 to 1874 - Privileges granted by Catherine the Great are taken away from the German colonists. 1872 - Wildfires destroy part of Norka. These were the largest fires in the history of the colony. 1874 - The first men from Norka were called to military service in 1874. 1874 - Volga German scouts sent to the USA to determine if conditions are suitable for settlement. 1875 - Among the first Volga Germans in the United States are families from Norka. 1877 to 1878 - Volga Germans are conscripted to fight in the Russo-Turkish war. 1880 - The foundation stone for the third church is laid on June 2nd. 1882 - The third church in Norka is completed under the leadership of Rev. Wilhelm Stärkel. 1891 to 1892 - Famine strikes the Volga region. 1894 - Alexander III dies and is succeeded by his son, Nicholas II. 1898 - The Marxist Russian Social Democratic Labour Party holds its first Party Congress. 1898 - A description of Norka is written by A. N. Minkh, a member of the Saratov Scientific Archive Commission. 1901 - The Socialist-Revolutionary Party is founded. 1904 to 1906 - The disastrous Russo-Japanese War plants the seeds for overthrowing Czar Nicholas II. 1908 to 1910 - Another cholera epidemic strikes the lower Volga River region. 1910 - Peter Sinner proposes to put street lights throughout Norka. He tells the town council that if they buy and set up the poles and electrical wires, he will supply the lights and power. The council votes "No." 1912 - The population of Norka peaks at 14,236. 1914 to 1918 - World War I consumes Europe and places the Volga Germans in a precarious position. 1914 - A medical and dental clinic is built in Norka. 1917 to 1922 - The Bolshevik Revolution divides Russia and leads to Civil War. Vladimir Lenin assumes control of Russia. 1918 - Nicholas II and the rest of the royal family are executed on direct orders from Lenin. 1918 - The Council of People’s Commissars of the Russian Soviet Federated Socialist Republic (RSFSR) creates the Volga German Workers' Commune. 1921 to 1924 - A severe famine strikes the Volga German colonies and tens of thousands die. The population of Norka declines to 6,913 in 1923. 1923 - The Volga German Commune is reorganized as Volga German Autonomous Soviet Socialist Republic. 1924 - Lenin dies and Josef Stalin assumes leadership of the Communist party. 1928 - Heinrich Wacker returns to Norka and brings his movie camera. 1930 - The Gulag is officially established. 1930 - Volga German farmers, considered Kulaks (rich peasants) by the Soviets, are forced to work under collectives. Their property and farms are confiscated by the Soviet government. Many are killed or sent to Gulags. 1932 to 1933 - A famine created in large part by the Soviets strikes the Volga region and the Ukraine. 1936 to 1938 - Stalin's Great Terror sweeps across the Soviet Union. 1937 - The Narodnyy Komissariat Vnutrennikh Del (NKVD) troika sets nationwide quotas for the execution and enslavement of "anti-Soviet elements." 1938 - A new decree requires the teaching of Russian in all non-Russian schools. 1939 -The Molotov-Ribbentrop Pact is signed, promising mutual non-aggression between Germany and the Soviet Union and agreeing to a division of much of Europe between those two countries. 1941 - In June, Adolph Hitler betrays Stalin and Nazi Germany attacks the USSR in Operation Barbarossa. 1941 - The Soviets claim that all ethnic Germans are "spies and saboteurs" and deport the Germans to Siberia and Central Asia. People from Norka are confined to Special Settlements and Labor Camps. This marks the end of Norka and the Volga German colonies which were founded from 1764 to 1767. 1942 - On May 19th, all German place names (including Norka) are removed from the Volga colonies. 1946 - The Labor Camps are abolished, but Volga Germans must remain in Special Settlements and are forbidden to return to the Volga region. 1953 - Stalin dies and he is succeeded by Nikita Khrushchev. 1955 - Ethnic Germans are again allowed to have internal passports. 1956 - Soviet leader Khrushchev condemns the deportations as a violation of Leninist principles. 1964 - The German Russians are declared to be "rehabilitated" but are still forbidden from returning to their homelands. 1972 - Restrictions are lifted on where Volga Germans can live within the USSR, but they are discouraged from returning to the Volga homeland. 1979 - The government considers establishment of an autonomous German region in northern Kazakhstan. Local opposition stops the plan from going forward. 1989 - The Wiedergeburt (or Rebirth) movement by leaders of the German minority in Russia attempt to gain the right to return to their former homes. The proposal is denied by the government. 1990 - Soviet President Mikhail Gorbachev signs a decree "On the restoration of the rights of victims of political repression 1920-1950." Unfortunately, much of what was promised to repressed peoples, including the German Russians, is never implemented. 1991 - The Communist party falls from power and the Soviet Union breaks up into independent states. 1991 - The Russian government belatedly issues a decree rehabilitating all victims of political repression. 1991 to 2006 - Millions of Russian Germans immigrate to a unified Germany where they are offered citizenship stemming from their German ancestry. Today - Descendants of those who once lived in Norka are dispersed all over the world with the highest concentrations living in the United States, Canada, Germany, Russia and Kazakhstan. The video below provides a comprehensive overview of the history of the Volga Germans.